Looking for Dutch oven recipes to try the next time you’re doing some outdoor cooking? The Dutch oven is such a marvelous creation. Can you imagine a cooking pot that lets you bake bread and cook other delicious food that would normally need an oven? If you and your family love camping, a Dutch oven is your new best friend. Here are a couple of campfire recipes to get you started. Serve these mouth-watering and easy Dutch oven recipes to your family. They are sure to satisfy, especially after a long day in the great outdoors! One of the good things about having a Dutch oven is being able to bake fresh bread while you’re out camping. 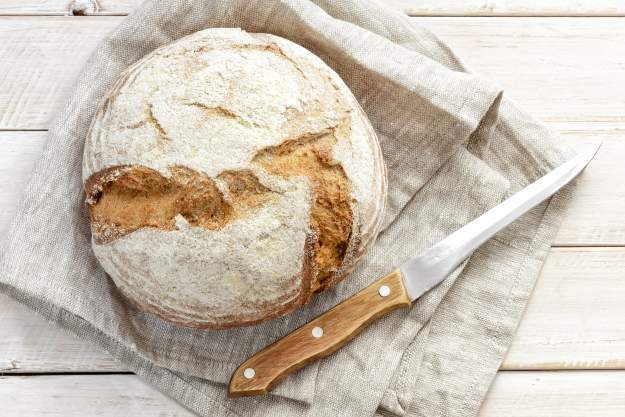 Learn how to do it without your usual kitchen oven by giving this sourdough bread recipe a try. Ever thought of having freshly made pizza where your favorite pizza delivery can’t reach you? Whether you’re camping or just hanging out, this pizza recipe will be great for any bonding moment. This food is a delicious American classic that everyone adores. If you normally cook your chicken pot pie in the oven, here’s your chance to make it a little differently. See how here. Here’s another classic and a perfect outdoor Dutch oven recipe everyone loves. Give a new twist to the classic s’more by allotting 10 minutes of your time to make it wonderful. Recipe here. Have you ever seen chicken this delectable? Okay, maybe you’ll need an oven for this, but the Dutch oven is what makes this chicken recipe so easy to pull together. You don’t need any special preparations for your potatoes except for a clean scrub. It’s very easy to cook and a tasty recipe worthy of your Dutch oven. No peel, no boil, no bake, great! Check it out here. Dutch oven peach cobbler is an amazing American classic. It’s a delicious mix of peaches, cinnamon, and butter cooked the Dutch oven way. So delicious, you’ll be surprised it’s homemade. Recipe here. In case peach isn’t really your fruit of choice, this apple crisp recipe will do the trick. Make the apples nice and tender in your Dutch oven, then serve it with ice cream on top. It’s easily one of the best desserts ever. Craving for your favorite cinnamon rolls? You’ll love these sticky rolls whether you’re camping or at home. Learn how to bake them in a Dutch oven and enjoy! Get the recipe here. This creamy casserole recipe can be found in almost every community cookbook. The ingredients don’t need pre-cooking, so everything’s easier than you expected. This chicken Dutch oven recipe is just oozing with goodness. See it here. Ever tried cooking with your favorite soda, Sprite? Here’s your chance to make your own Dutch oven sprite chicken. I guarantee, it’s delish! Read more about it here. The three things I’m in love with. Nothing can go wrong with ham, cheese, and potatoes especially when cooked the Dutch oven way. I’d love to try adding some bacon to the mix. See it here. You’ll just need three things to make this popcorn and the first one is a Dutch oven. With some vegetable oil and corn kernels, all you need to do is listen until the popping stops, you’re all set for snack time! Check it out here. So there you have it! Think of all your Dutch oven can do when cooking these mouth-watering recipes. This cooking tool is extremely safe for use on your stove top, on your grill, or even put it right into a campfire. And it sure does make delicious food, every time! Have you tried cooking any kind of food with a Dutch oven? Tell us about it in the comments section below! Editor’s Note: This post was originally published in April 2016, and has been updated for quality and relevancy.